We provide integrated solutions for the automotive industry, our expertise in car seat and automotive interior design and manufacturing enables our customers of car seat covers, automotive interiors to achieve their long-term operational excellence and cost reduction objectives. In the evolving automotive market, companies are looking for new ways to preserve margins and stay ahead of the competition. 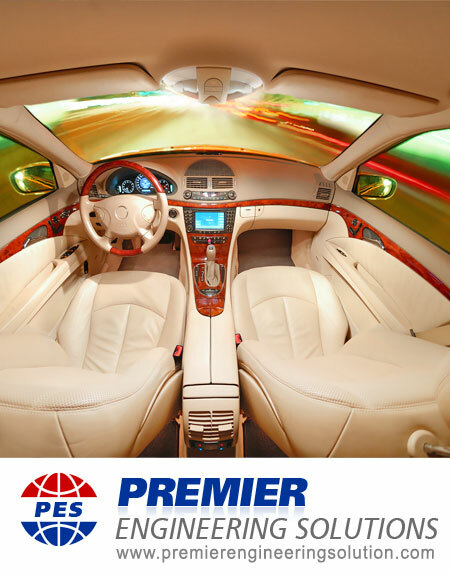 Through close collaboration with our customers, Premier Engineering Solutions has developed automotive upholstery solutions with leather and fabric cutting for car seat and automotive interior design. The vehicle interior designs includes the proportions, shape, placement, and surfaces for the instrument panel, seats, door trim panels, headliner, pillar trims, etc.We work closely with our customers to develop product systems to meet specific design, quality, performance and production needs. We provide expertise in each of the key areas from concept to production and assembly. Our seat design team experts are fully integrated into commercial 3D CAD systems, allowing you to design and manufacture innovative transportation seat systems. We provide you a complete digital product definition of a seat system in the software, which accurately and efficiently shares design detail with all aspects, eliminates extensive physical prototyping and reduces time-to-market. All aspects of the automotive seat design are captured in a single 3D CAD master model.